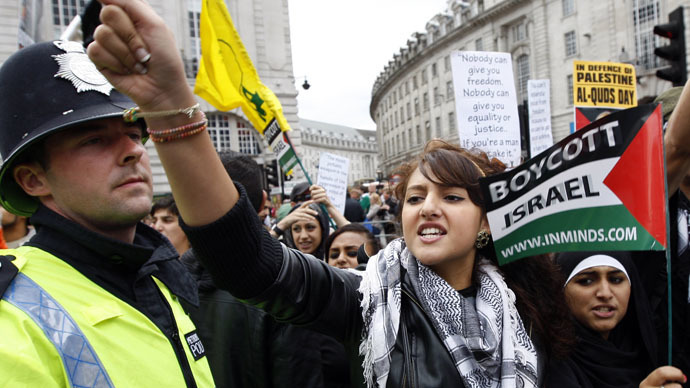 A British Foreign Office minister has said the UK is committed to opposing a boycott of Israel. The statement comes after Israeli Prime Minister Benjamin Netanyahu condemned a vote by the National Union of Students (NUS) vote to boycott goods from Israel. Tobias Ellwood MP sent the message on Twitter to Israeli National Security Adviser Yossi Cohen on Wednesday. The Conservative Minister for the Middle East said he had a “useful” meeting with Cohen, before reaffirming the UK’s opposition to the boycott, divestment and sanctions (BDS) movement. His comments come days after the NUS passed a motion to boycott Israeli goods in solidarity with BDS. The Tory minister expressed his opposition to sanctions in a parliamentary debate on a motion to recognize Palestine’s statehood last December. Useful meeting with Israeli NSA Yossi Cohen. Good discussion on #Gaza. Reaffirmed UK commitment to #Israel and opposition to boycotts. A majority of British MPs passed a non-binding motion to recognize Palestine as an independent state last October. National Security Advisor Cohen has been making the rounds in Europe, having spoken on the phone to a senior French official on Friday. The unnamed French diplomat reportedly accused Israel of exerting “excessive” pressure in the wake of telecommunications company Orange’s decision to withdraw its operations from the country. Orange CEO Stephane Richard told reports in Cairo on Wednesday he was ready to “withdraw from Israel,” citing the company’s sensitivity to Arab countries. Orange is part-owned by the French government, but officials in France said the decision was up to Richard. Netanyahu also publicly expressed anger at the NUS, the largest student union in the country, for passing a motion in support of a boycott of Israeli goods. “This is less than a year after they refused to support a boycott of ISIS,” he said in a meeting with Canadian Foreign Minister Robert Nicholson in Jerusalem. The NUS national executive passed the motion with 19 votes in favor, 14 against and 1 abstention. Proponents of BDS say economic pressure will force Israel to change its policy, acknowledge its actions in Gaza and, allow encourage the creation of a Palestinian state. The movement has been gaining traction in recent months, with several high profile musicians canceling performances in Israel in protest against the state’s treatment of Palestinians. Israeli government officials have responded angrily to BDS successes. “The boycotters of Israel are not looking ... to partition the land of Israel, but to erase the state of Israel,” Justice Minister Ayelet Shaked said this week.